Isn't this marvellous? All those who say Greece hasn't done any reforms now have egg on their faces. Greece deserves hearty congratulations for its reform effort. And as the headline says, all those reforms are paying off, aren't they? Since the GDP growth in 9 of the 10 countries is actually lower in 2014 than it was in 2007, and the tenth country (the USA) has made no significant reforms, it is not evident from these charts that "reform" makes any difference at all. But Germany made painful reforms in the early 2000s. Surely a decade is long enough for reforms to be bearing fruit? Yet its GDP growth is worse than the USA. And if you happen to live in Slovakia, you could be forgiven for believing that "reform" makes you substantially poorer. The bounce back of non-reforming countries from the 2008-9 crisis was short-lived. 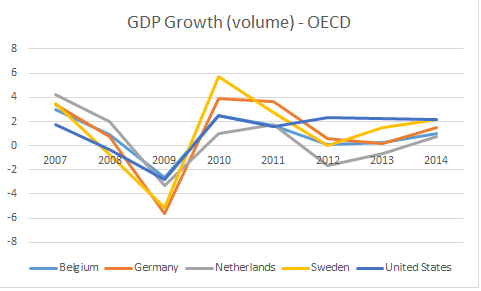 Finland, Germany, Belgium and the Netherlands all suffered a sharp drop in GDP growth in the Eurozone crisis. In short, their GDP growth both before and after the crisis was unsustainable. It is hard not to conclude that the bounce back of non-reforming countries after the 2008 crisis was achieved at the expense of their weaker Eurozone partners, who were unable to bear the burden. When they collapsed, what was in effect an aftershock from the 2008 crisis transmitted itself back to the non-reforming countries, who were then forced to absorb what they had tried to avoid. Understandably, they were angry. And still are. Hence the stony refusal by these countries to consider proposals for a gentler approach to reform. It is not clear to me why countries whose GDP growth is on an unsustainable path and vulnerable to external shocks should be excused reform. Though GDP growth for these countries appears to be converging on to a lower path: it seems the "reforms" of weaker countries are forcing stronger ones to temper their expectations. However, this is not as good as it appears. Because stronger countries have learned no lessons, they seem intent on continuing their beggar-my-neighbour policies outside the Eurozone. And their lower GDP growth expectations don't encourage intra-Eurozone trade to develop. This is not viable. The future of the Eurozone depends on stronger intra-Eurozone trade and a more cooperative approach. The reforming countries have made deep and painful cuts to domestic consumption - hence their recessionary economies - and rebalanced towards exports. Now it is time for the non-reformers to reform. They must increase domestic investment and raise consumption. Without that, the weaker countries cannot recover. And without recovery for the weaker countries, the Eurozone is doomed. Please define exactly what you mean by Reform. Is it lower taxes? Smaller govt workforces? Weaker unions? Looser workrules? I think I have made it very clear in the last paragraph both what the periphery countries have done in the name of reform and what core countries must now do. Are trade balances what the OECD was measuring? Whatever metric they're using, the Greece result seems a bit suspicious as intuitively the Greeks don't seem to have reformed materially more than the others, just shrunk the state to a greater extent -- as such not a structural reform, which is about doing things better, not just doing less of the same. I completely agree. The "shrink-the-state" mob assume that there is a well-functioning private sector ready and able to rush into the space left by drastic cuts in public functions. In much of Southern Europe, for historic reasons, that's not the case. 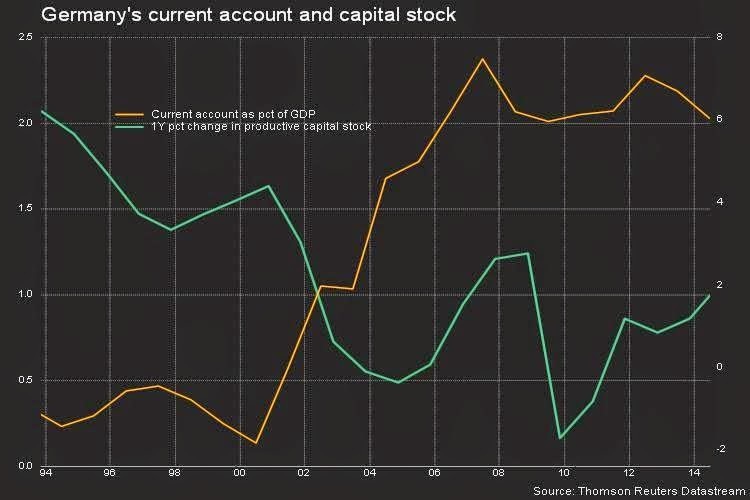 Greece's private sector is very weak and dominated by vested interests. Troika-imposed tax hikes have not helped matters: the rich who can avoid taxes do so as they always have done, because Greek authorities lack the will or the power to address this, so the taxes fall on small businesses and ordinary households, causing bankruptcies and deeply depressing domestic demand. Tony Yates argued recently that there was no point in privatisations if the assets were simply going to be bought by oligarchs. Greece needs radical reform and strengthening of institutions so that its private sector can develop, not tax hikes and spending cuts that force it to contract. I agree there are more ways than one of developing intra-Eurozone trade. But your suggestion implies that the U.S. acts as consumer-of-last-resort for the Eurozone, doing the spending that Germany won't. I don't think this is either reasonable or sustainable. Syriza/Greece could easily and cynically trade labor "reforms" for the package because the reality inside Greece is that 27% unemployment and 50%+ for younger workers has created desperate working conditions. People are scrapping for jobs. Many work without pay, not for weeks, but months. Many work overtime hours for part-time pay and benefits. It's the wild west of labor conditions. Talk to a Greek business owner. I have. If they say they do not control labor conditions, they are absolutely lying. While it's also true that the skimpy pay and benefits they offer turn away a great many applicants, they have no shortage of workers to take the jobs. They also turn many many away. Labor regulations in Greece are totally unenforceable at this moment. "..the rich who can avoid taxes do so as they always have done, because Greek authorities lack the will or the power to address this.."
So much for Greece's reform ranking, don't you think? Anyhow, you've proved that reforms are good - but nobody likes them. Is that a reason to fulfill Syriza's wishes? This. A "reform" that Greece has NOT done is start collecting tax revenue like northern Eurozone is doing. It has gone up from 29 % to 32 % but is still substantially lower than northern Eurozone members. I'm not suggesting the US as a consumer of last resort (though I understand it looks like it), but rather as a purveyor of cultural arbitrage products, that make spending look like investment and thus help bridge the gap between mismatched propensities to spend/save. Here the US role is as as an agent, not principal. The handbags that the US, as agent, keeps are to be seen as an arrangement fee for the product. The (possibly debatable) thesis behind this suggestion is that imbalances are primarily cultural, and thus need to be cleared regularly rather than suppressed, and thus policy should be aimed at finding the safest clearance channel(s) possible rather than try to change culture. Use an umbrella rather than try to abolish rain. Sorry if it still makes no sense, I may try to write a longer form of this argument some day. The last paragraph is clear enough. Er..wrong. They were actually quite enforced. I know a few people who worked on this OECD and most of Portugal reforms(as well as Spain) are enough to embarrass some of you lot who continue to tell unverified statements without any deep understanding of how these studies were made. Sorry, I'm not an economist but "deep and painful cuts to domestic consumption" doesn't sound like "Reform". It sounds like asphyxiation. Euro countries seem require massive changes to work rules and regulatory overreach, along with reductions to union power and lower taxes to stimulate growth. Obama seems shocked that US companies park $2 Tril overseas rather than pay 35% tax to bring it home and invest in a more hostile US economy. 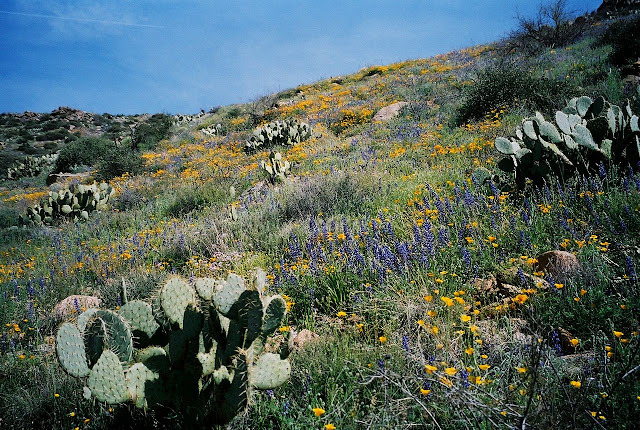 Reform would entail tax reform/reductions and regulatory reform to reduce, among many other things, environmental costs. Completely wrong this comment. Those "reforms" you mention are all suply-side (and not even the correct ones since it is enforcing what it is already a mistake, just look at those GINI coes.). Eurozone has a demand-side problem. Those GDP figures and tendencies are more than enough to show you that. Even if you are not an economist. But then you tweeted this 13 mins ago: "oh, I agree. But the "reforms" weren't abt fixing Greece. Were abt repaying creditors.". When is "Reform" actually "Reform"? Clearly sarcasm doesn't come across on Blogger any better than it does on Twitter. The position is this. Greece has done extensive "reforms" imposed by the Troika with the sole intention of ensuring a swift repayment of debt. These "reforms" have done substantial damage to the productive capacity of the economy: it has shrunk by a quarter, and the appallingly high unemployment levels suggest an output gap of something of the order of 35%, which is higher than in the US or Germany when the Great Depression was at its deepest. As a direct consequence of this destruction, the debt burden has actually risen considerably versus GDP. in other words, Troika "reforms" have actually made Greece LESS able to pay its debts, not more. But there is no denying that reforms have been made. Some argue that the rise in Greece's debt/GDP burden indicates that they have not made enough reforms. The OECD's figures give the lie to this. Rather, they suggest that the Troika reforms THEMSELVES are contributing to Greece's poor performance. The most-reformed country is also the most deeply depressed. Reforms are needed. But not these ones. When you are a EU/EZ member or aspiring to be, de facto only way to growth for you is promoting NX. Maastricht/Lisbon/Fiscal pact are there exactly because of this. Have we heard anything about redesigning "convergence" rules eg. to 8% of GDP in regards to the budget deficits ? NO! Jacking up "C" and "I" components without relying on "NX" means increasing "G" and this in turn will cause deficits to rise and we all know the rest of the story. It's export of die paradigm. Sad but true. We need VASTLY more information on this before saying that the pro reform lot have egg on their faces. 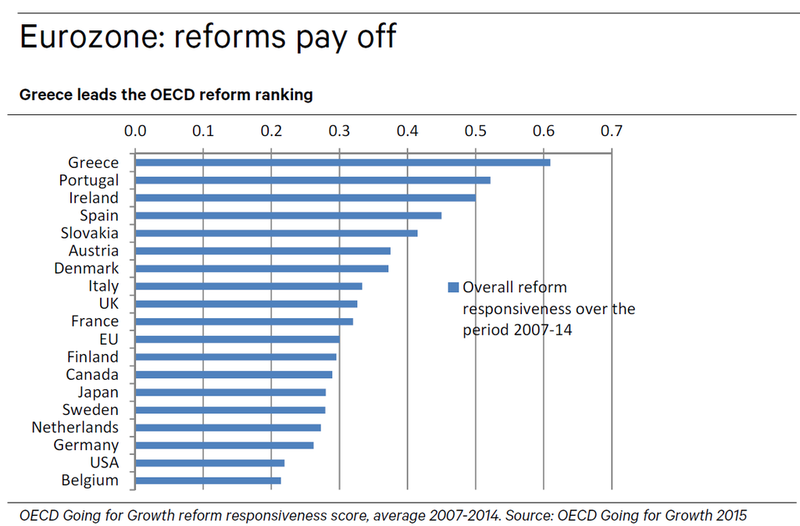 First, the fact that Greece comes top of the “reform class” (as per the first chart above) doesn’t prove they’ve actually done much reform. I.e. could be that Greece has done a minimal amount of reform, and other countries have done even less. In fact I suspect that’s actually the case in that my impression is that Greece has largely failed to deal with widespread tax avoidance and its bloated civil service. Second, the advocates of reform would only have egg on their faces if they claimed that extensive reform brought about a LARGE proportion of total reduction in periphery costs that are needed to make periphery countries competitive. Personally my hunch is that while reform can’t do any harm, it won’t DRAMATICALLY reduce periphery costs. I.e. internal devaluation is needed as well. But to repeat, that’s only a hunch. If anyone has any decent information on that point, I’m all ears. Tax avoidance is a patriotic duty in the eurozone. 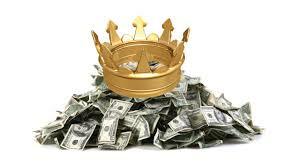 Please remember the big bank has cut off the industrial recycling mechanism in these fiefdoms so as to save its cold dead heart. 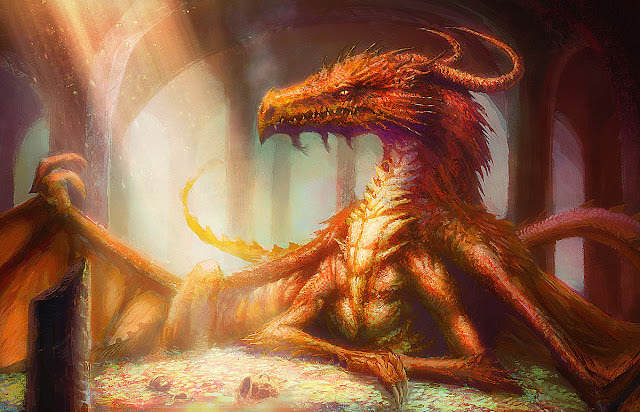 In fact it has created a entirely new form of usury. In the past you paid interest on the money you were given to spend. Now they expect people to pay interest on money which never even existed in the first place. If you think that the OECD is incapable of measuring the extent and effectiveness of economic reforms -- all of which are supposedly prescribed by the Troika in the case of southern countries -- then perhaps you can suggest who is able to measure these things. And advise us of the actual measurements. Of the many reforms Greece undertook, prescribed by the Troika, there were very few that I considered sensible or appropriate for economic progress. Most were simplistic liberalisations of regulated sectors -- sectors whose regulation was desirable, even if the form of regulation was far from satisfactory. In other words, the reforms were clearly useless. The analysis here corroborates my earlier conclusions. Basically, the neoliberal morons of the Troika got it wrong, and have fucked up Europe. It's about time that heads rolled for the massive incompetence we have seen with banking deregulation and the continued deregulations and privatisations currently being forced on the populations of Europe. Read Samir Amins take on the implosion of European capitalism. Which is what makes reasonable chaps such as Yanis v so dangerous. His tactics are perhaps more effective. Check out this wonder full bottom up view of society using the eyes of Shakespeare's mother. It started with big henry stopping old ladies lighting candles in church........but most things went on as usual for a time. Then reform went exponential as it needs to be so as to follow interest into the abyss. These societies are structured so as to conform to the needs of the super companies. Progressives do not want to alter this dynamic. Their mission in life is to make the extraction more sustainable over the long term. So the societies remain dysfunctional and unnatural. In Greece its got to the point of total societal breakdown. So therefore progressive voices appear reasonable , but in reality they are working for the same company. Not sure the Netherlands has a real trade surplus. I would guess the data is corrupted by Rotterdam entre port and wider Rhine / Ruhr activities. In reality I image the real human economy of Holland is much like the south of England - structure to accept the vast industrial surplus of euro land. For example, the employment rate growth in Greece over the year to Q3 has been above the EU average. And Germany, Japan and the UK - amongst others - have labour market outcomes that are at historical highs. It may, therefore, be that 'reforms' have had a bigger structural effect on the ability of countries to increase employment than in (immediate) improvements in either the product or the financial markets. If this is the case then, compared to the mass unemployment of the 1970s and 1980s, we are delivering growth that is spread across more workers. And in some countries, for example the UK, the biggest employment rate improvements have been amongst those who started off in the worst position - contributing to a reduction in income inequality at the bottom end of the distribution. I really have no idea what you think you are talking about. The UK labour market changes (I shudder at the abuse of the word "reforms") have resulted in massive welfare dependency of those in work, to the point that the UK welfare system is now a major employment subsidy. This was taken a stage further with the highly abusive and exploitative "zero hours" contracts -- tying low-paid workers into exclusive contracts with variable or zero hours. The income distribution in the UK has never (in modern times) been as bad as it is now, especially when one considers the appalling state of the housing market. Of course, the principal beneficiaries of these alleged reforms are employers and government, with artificially low unemployment rates alongside aggressive state action against anyone signing on as unemployed. The effect has been to nudge up the unemployed population into being semi-unemployed on very low income and dependent on housing benefit, income support and child support: this is your idea of reducing income inequality? 2 men who have a dispute seek solution through the Imam. So the first man makes his case and the Imam says "You are right". Then the second man breaks his case and the Imam replies "You are right" again. Suddenly a person from the crowd watching yells " That is impossible. They cant be both right." The Imam answered "You are right too!" "It is hard not to conclude that the bounce back of non-reforming countries after the 2008 crisis was achieved at the expense of their weaker Eurozone partners, who were unable to bear the burden." If you really continue to believe that the bounce back of non-reforming countries after the 2008 crisis was achieved at the expense of their weaker Eurozone partners, who were unable to bear the burden, then you'll believe anything. You haven't exactly produced any evidence for your assertions, so no, I won't "reconsider". You make the surprising statement: that "the bounce back of non-reforming countries after the 2008 crisis was achieved at the expense of their weaker Eurozone partners". 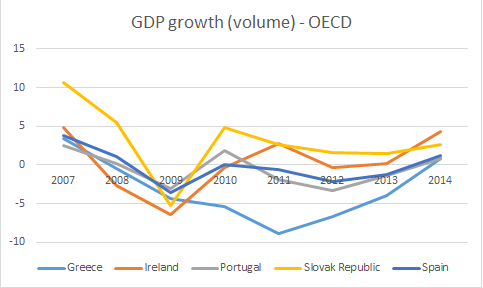 Now, the reforming economies were minuscule: Greece, Ireland, Portugal, Slovakia; only Spain was a bit larger. 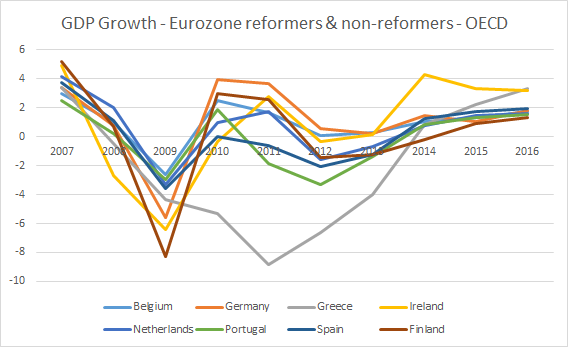 Those economies were simply not strong enough to to finance the the bounce back of non-reforming countries - by your account, they are: Germany, Netherlands, Sweden, Belgium, Finland (the US don't count here). That is my evidence. You have not produced any. I would suggest you look at the complete OECD chart, not just my cut-down version of it. Some of the largest economies in Europe are net "reformers". At the time of the financial crisis, the Eurozone was a largely closed economy: strong performers were financed largely by exports to weaker ones, which the strong performers funded with loans from their banks. The financial crisis replaced that bank loan funding with debt on the balance sheets not of the strong countries whose banks provided it, but on the balance sheets of the weaker countries. That, in a nutshell, is how the sovereign debt crisis came about.